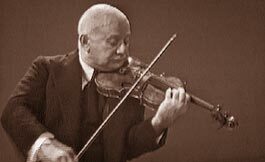 Elman, Mischa (actually, Mikhail Saulovich), remarkable Russian-born American violinist; b. Talnoy, Jan. 20, 1891; d. N.Y., April 5, 1967. At the age of 6, he was taken by his father to Odessa, where he became a violin student of Fidelmann and a pupil of Brodsky. His progress was extraordinary, and when Leopold Auer heard him play in 1902, he immediately accepted him in his class at the St. Petersburg Conservatory In 1904 he made his debut in St. Petersburg with sensational acclaim; on Oct. 14, 1904, he made a brilliant Berlin debut; on March 21, 1905, he made his first appearance in London to great acclaim. On Dec. 10, 1908, he made his U.S. debut as soloist in an extraordinary performance of the Tchaikovsky concerto with Altschuler and the Russian Symphony Orchestra in N.Y., and was hailed as one of the greatest virtuosos of the time; he played with every important symphony orchestra in the U.S. In the following years, he played all over the world, and, with Jascha Heifetz, became a synonym for violinistic prowess. His playing was the quintessence of Romantic interpretation; his tone was mellifluous but resonant; he excelled particularly in the concertos of Mendelssohn, Tchaikovsky, and Wieniawski; but he could also give impressive performances of Beethoven and Mozart. He published several violin arrangements of Classical and Romantic pieces, and he also composed some playable short compositions for his instrument. His father published a sentimental book, MEMOIRS OF MISCHA ELMAN'S FATHER (N.Y., 1933). In 1923 Elman became a naturalized American citizen. A. Kozinn, M. E. AND THE ROMANTIC STYLE (Chur and N.Y., 1990). Source: "Mischa Elman." BAKER'S BIOGRAPHICAL DICTIONARY OF MUSICIANS®, Centennial Edition. Nicolas Slonimsky, Editor Emeritus. Schirmer, 2001. Reprinted by permission of The Gale Group.